An important factor in the enjoyment of many activities is having the tools to do it properly, and collecting coins is no exception. The right tools allow you to get started sooner, reduce frustration, and have more success with whatever it is you're trying to do. I'm going to share what I've found to be the essential tools for a world coin collection, so that you or someone you know can start enjoying this hobby more quickly and easily. Flips store and protect individual coins, and allow them to be labeled. The most common size is a 2-inch by 2-inch square, made of either plastic-lined cardboard (called "cardboard flips" or "paper flips"), or clear plastic (generally called just "flips" and made of vinyl or a non-vinyl plastic). Cardboard flips have a circular window which allows the coin to be viewed from both sides while still sealing it in. Clear plastic flips are a clear pocket which holds the coin (also allowing viewing from both sides). I prefer cardboard flips. They are less expensive, you can write directly onto the flip, and they keep the coin from sliding around in its holder. Clear plastic flips are more expensive, but they can be re-used (they do not have to be sealed with tape or staples). Instead of writing directly on the flip, you label the coin with a slip of paper that is inserted into the flip. Plastic flips can be used with any size coin (as long as it's less than 2 inches in diameter), but with cardboard flips you should try to match the window size to the coin (though I've found that 2 sizes - quarter and half-dollar - are sufficient for 90% of world coins). If you are using cardboard flips, you need a stapler or clear tape to seal the flips shut. There are self-adhesive flips you can buy, but they are considerably more expensive. 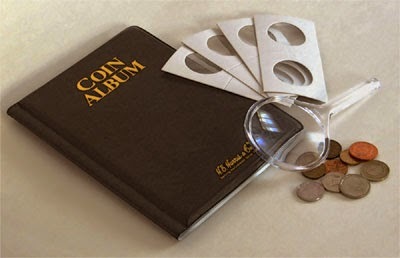 Once coins are individually stored in flips, they can be stored in pocket pages inside a 3-ring binder. This type of storage allows the coins to be easily seen or displayed, but has the disadvantage of being more expensive than box-type storage (discussed below). Any standard 3-ring binder will do (check office-supply stores or even thrift stores like Goodwill). A 3-inch binder (where the rings have a diameter of 3 inches) can hold between 15 and 20 filled pocket pages. I've found that binders with D-style rings are easier to use than standard circular rings. The D-style rings allow all the pages to lay flat when the binder is open, and it is easier to add or remove pages when the binder is nearly full. When the binder is closed, none of the pages are on the ring seams so the pages are not likely to fall out. Pocket pages go inside the binder and hold 20 coins (in flips) per page. Be sure to look for 20-pocket pages if you are using 2-inch-square flips. Pocket pages can hold coins that aren't in flips, but the coins will fall out very easily if the binder is put on its side or turned upside down. I prefer pocket pages that have a cutout at the bottom of each pocket (sometimes called a "thumb-cut"). The cutout makes it easier to remove coins when you need to rearrange them - which, unfortunately, you have to do when you want to put a new coin in between two coins already in a page. Instead of using a 3-ring binder and pocket pages, you can store your coins (in flips) in special 2-inch-square coin boxes. These are long, thin boxes that can hold closed flips standing up, like files in a filing cabinet. This is a much less expensive type of storage because boxes are cheaper than binders and you don't have to buy pocket pages. Using coin boxes also makes it easier to organize your collection because you can add a coin in between any other two coins. With pocket pages, you need to take coins out and move them around in order to make room for a new coin (if you want to keep the coins organized). However, using coin boxes makes it harder to view or display your collection - it is much less impressive to flip through a box full of coin flips than to browse through pages of coins in a binder. I prefer using binders and pages for that reason - I like to look at my coins. Some coins are small, which makes the details on them (country name, year, etc.) hard to see. You'll frequently find yourself using a magnifying glass to examine a coin. A 4x magnifier should be sufficient for looking at coin dates or other writing. If you want to be able to look for coin errors (double-strikes, or double-date coins) or looking at mint marks, a loupe offers much greater magnification than a magnifying glass. When I need this level of magnification, I use a 30x loupe with a light. Part of the fun of collecting world coins is figuring out what country a coin is from. But this is a very frustrating process without some help. Web sites like World Coin Gallery and my own Portland Coins have information to help identify world coins using words or pictures that can be found on the coin. Books like the Standard Catalog of World Coins also have guides to help identify coins, but online resources are just as good (and they're free). Once a collection has more than 10 to 20 coins, it becomes difficult to remember what you have and what you don't have. The bigger the collection, the more important it is to keep track of what coins you have (so that you know which coins you don't need). For a collection of 50 coins or fewer, a written list of coins can be sufficient. On a piece of paper, write down the country, year, denomination (type and amount of money, like "2 dollars", "5 francs" or "50 yen"), and the quality ("poor", "good", and "great" are enough to get started with) of each coin in your collection. If you have room, organize them by country so that you can find them more easily. Keep the paper with your collection so that you don't lose it. Once you get more than about 50 or 60 coins in your collection, you're going to want to keep track of your coins electronically. This allows you to more easily search your collection, order them by country, and add new coins (your piece of paper will get pretty crowded if you keep adding to it). You can use a spreadsheet program like Microsoft Excel to keep track of the same information - country, year, denomination, and quality - in different columns. (Google Docs and Open Office are free and have spreadsheet programs.) Several free Web sites (Numista, World Coin Gallery, and Colnect are a few) allow you to keep track of your collection from any computer. These sites usually let you see pictures of the coins in your collection, and can help you see which coins you don't yet have. Flips, binder pages, coin boxes, and usually even world coins can be found at a local coin shop, where you'll be supporting local businesses and your local economy. If you don't have a coin shop handy, or they don't carry the supplies that you need, then coin collecting supplies can be purchased online at dozens of different stores (always shop carefully online), or of course from us at Portland Coins. This should be enough to get anyone started with their own world coin collection, and to have the right tools to make it a success.